IDmyStuff ID Labels - Never lose your things again! $9.95 per set with bulk discounts available. Podcaster, DJ, or Sound/Lighting Engineer? Things can get hectic and a little bit crazy. Keep your stuff together and keep your cool with IDmyStuff® labels. 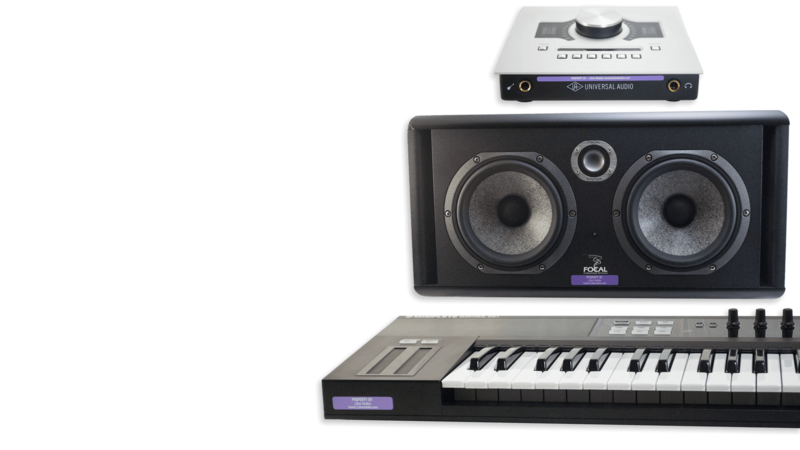 Give people a chance to return misplaced gear by putting your contact info on your monitors, headphones, microphones, and other studio or media equipment. Even better, twelve color configurations to choose from means you and all your friends can mix your stuff up and still be able to separate it out afterwards at a glance! Or use different colors to separate audio equipment from lighting gear. IDmyStuff® labels are waterproof, fade- and heat-resistant, dishwasher and microwave safe. The colors are eye-catching and stay bright through years of use. 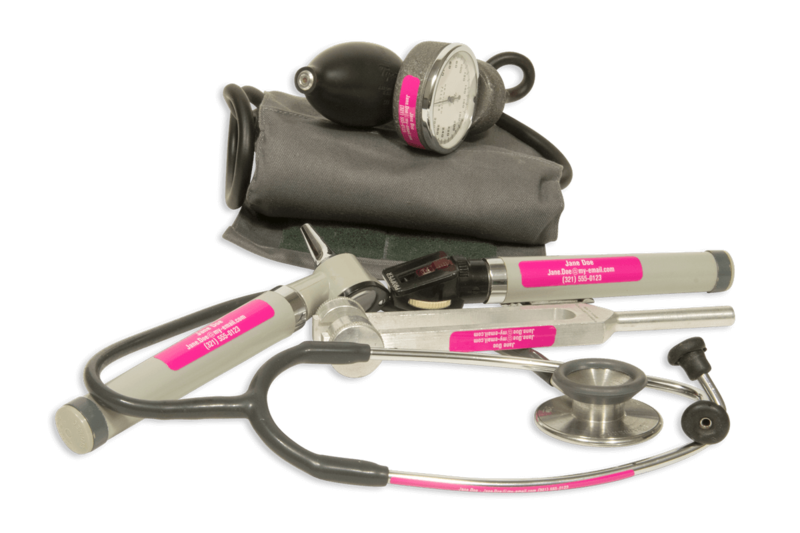 Everyone in your med school class got the same stethoscope? Make yours stand out from the crowd! 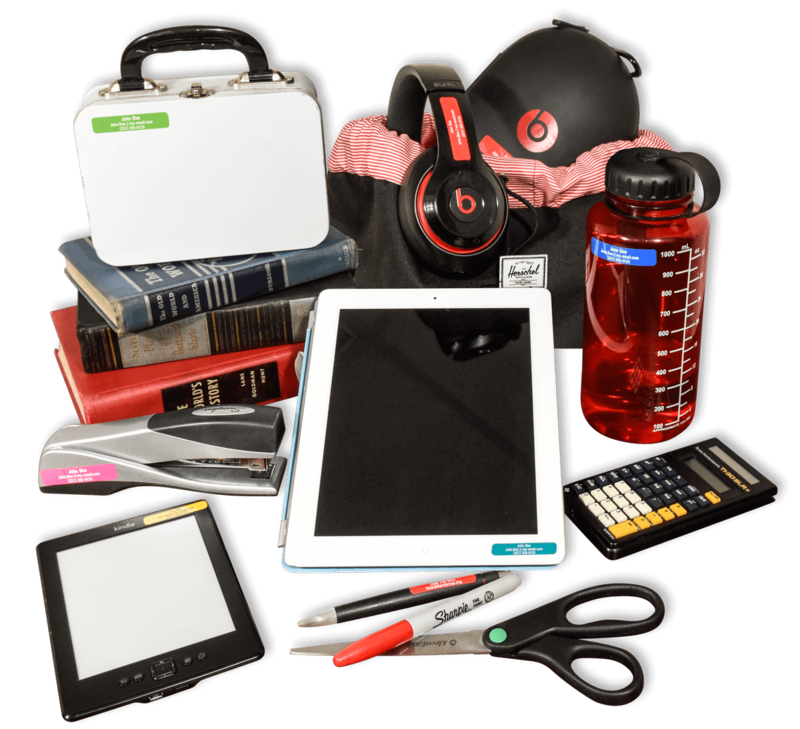 If you misplace something with an IDmyStuff® name label on it, chances are good someone will spot it and return it to you. Different sizes means there’s a label for everything. Three different sizes for small to large equipment. They adhere strongly and wrap easily around smooth cylindrical surfaces. Our adhesive name labels can be trimmed with scissors before they are applied, so even small pieces of equipment can be labeled. And the best part is, they are incredibly durable. They’ll stand up to the toughest conditions your gear will encounter. Whether you work construction or are just helping a friend finish his deck, having id labels on your tools just makes good sense. IDmyStuff® labels are made in the US and have an aggressive adhesive, so they don’t come off easily. Waterproof and durable. Up to three lines of text means you can include your name, number, and even a gentle reminder about where these tools belong. 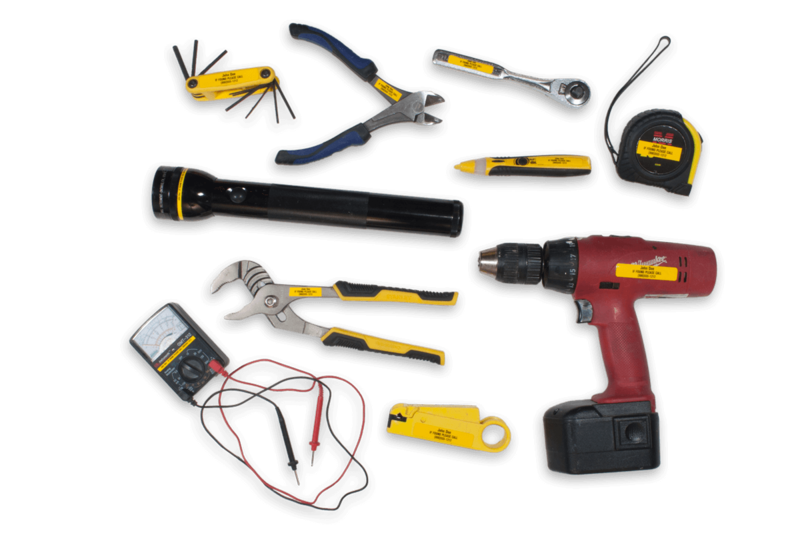 Make sure your borrowed tools make it back home with personalized id labels. Whether you work construction or are just helping a friend finish his deck, having id labels on your tools just makes good sense. IDmyStuff® labels are made in the US and have an aggressive adhesive, so they don’t come off easily. Waterproof and durable. Up to three lines of text means you can include your name, number, and even a gentle reminder about where these tools belong. Make sure your borrowed tools make it back home. 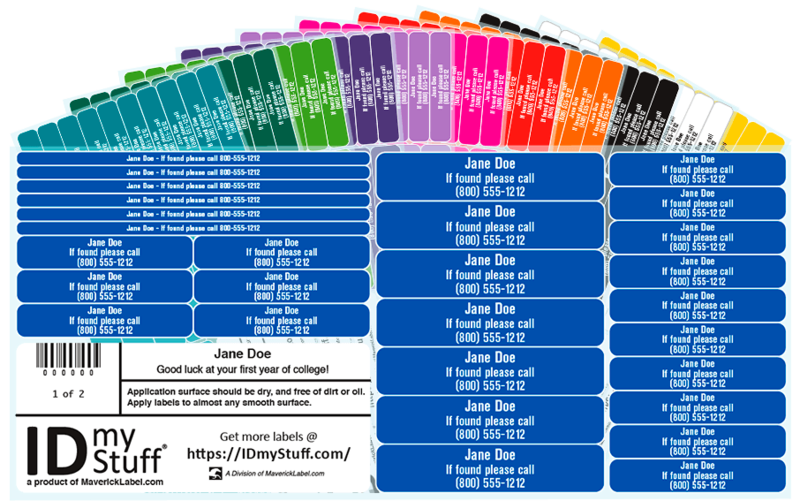 IDmyStuff® labels have an array of colors. 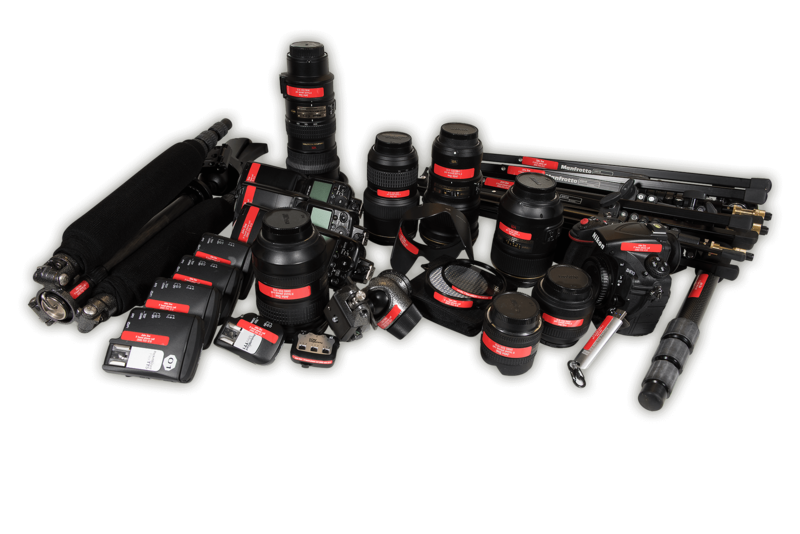 Choose labels to match your stuff, contrast with it, or color code all your equipment. The yellow and white labels have black text for high contrast (easier to read for visually impaired or color-blind individuals). All the labels are durable, waterproof, and heat- and fade-resistant. With free shipping to US addresses and bulk discounts (20% off 3-9 sets and 30% off 10 or more), these labels are a great value. And they make great gifts, too. Or Want That Elegant Metallic Look? 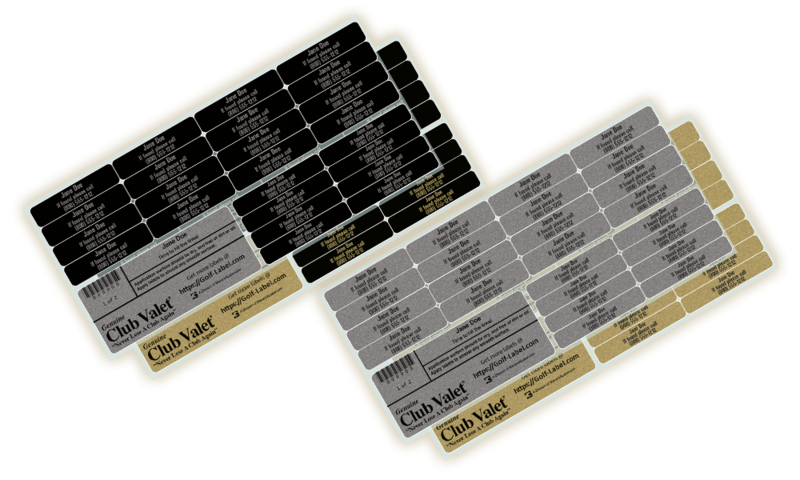 Club-Valet® labels have 24 labels in two different sizes (no slim ones). They’re great for golf clubs or other similarly-sized sports equipment – or if you just need more labels in the larger sizes. They come in black with your choice of silver or gold text, or in silver or gold with black text. 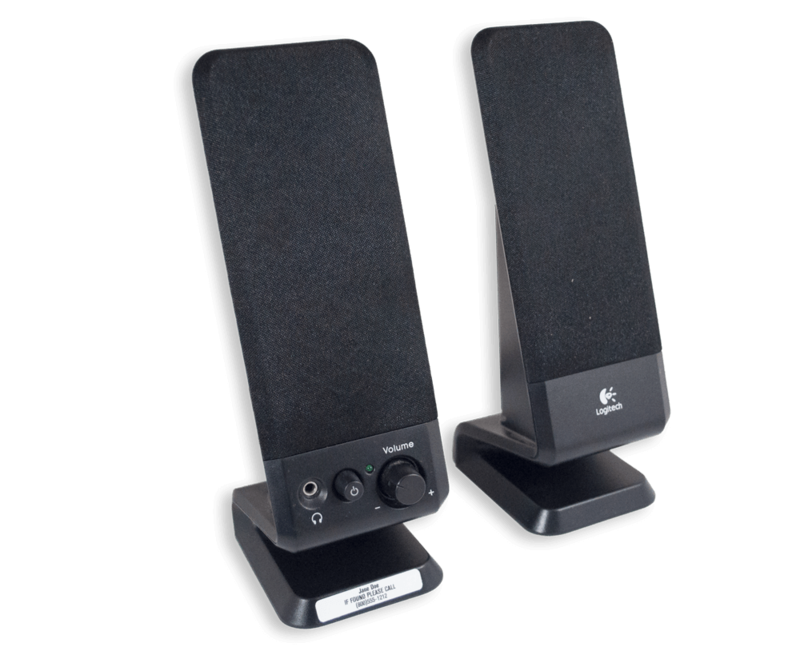 Same low $9.95 price, same discounts, even the same free shipping in the U.S. Need Barcodes or Serial Numbering? MaverickLabel.com, our parent company, has asset tags if you need more security features, want barcodes or serial numbering, or would like to include a logo. You can get custom shapes and sizes, too. No minimum quantity is required for asset tags. 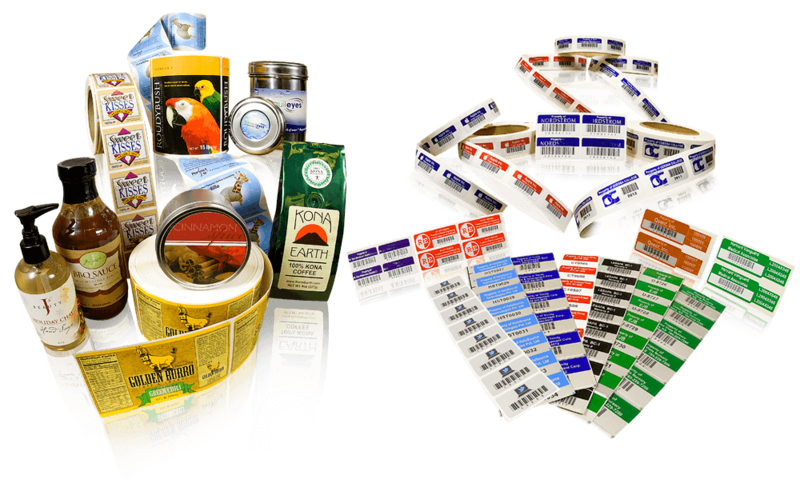 Or check out their product labels in a wide variety of materials and full-color options.